In this topology we see that there are two links between router R1 and router R2. We can establish two neighbor relationships, on both paths, but this is not a good solution. So, we’ll establish only one neighbor ship with each other. 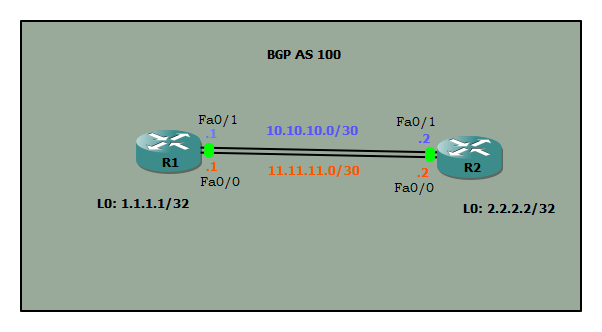 BGP gives us an option to change the source of packets sent. In this case we can use Loopback interface as source of BGP packets sent between these neighbors. By using a loopback interface as source interface we have two paths between them, if one of paths fails, the other one will be used. By using a loopback interface as update source, we also benefit from the fact that BGP session won’t go down when physical interface goes down. where ip-addr | group-name is ip address of the neighbor or peer-group name, interf – is interface that will be used as update source. For IGP connection of two router we use OSPF protocol in this topology, so let’s go our configuration part. 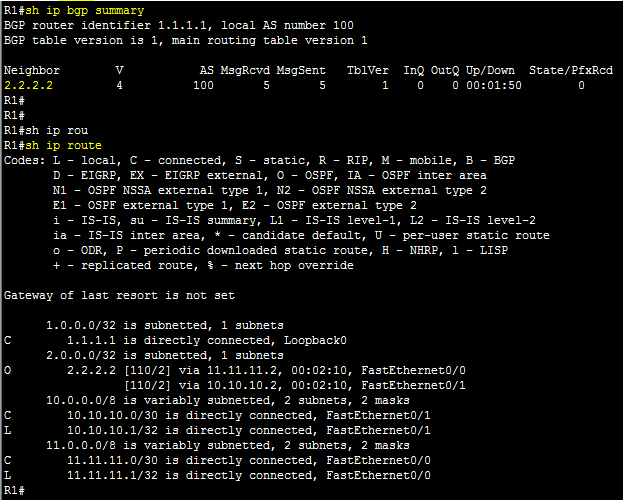 Here pink color highlighted commands are changed BGP update-source. Now we verify our configuration. From Router R1 bgp summary table we see neighbor is R2 router’s loopback 0 IP. so it’s work. Hi, thank you very much for this post! My doubt was answer completely. I hope you keep doing more posts like this one.